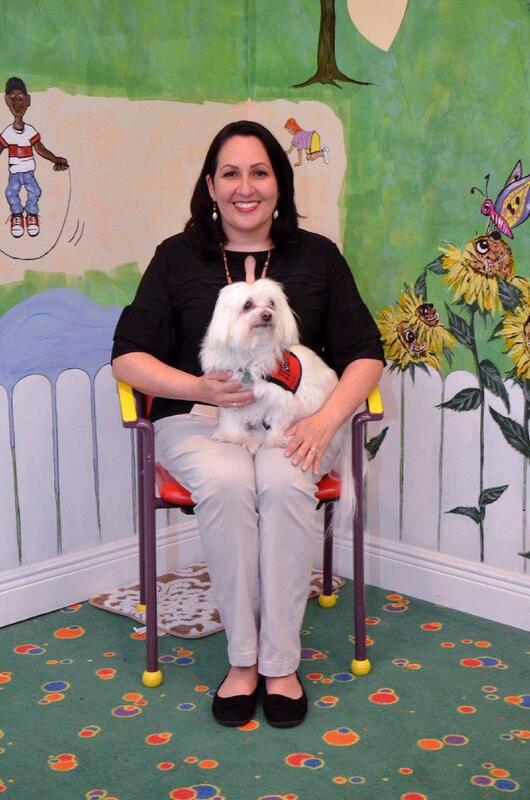 Meet Abbey, a trained 4-year old Maltese therapy dog and her owner/handlers, Roslyn Lindeman and Jennifer Town. Once a week, Abbey and the ladies help make the day a little better and brighter for child victims receiving services at the Emerald Coast Children’s Advocacy Center (ECCAC) in Niceville. Both ladies worked together with accomplished careers as registered nurses, Jennifer, a Captain in the Navy Nurse Corps, and Roselynn, in Civil Service. Along with Abbey, the ladies completed fifteen weeks of Basic, Advanced and Urbvan Pet and Handler Training at Pawtopia in San Diego, California. Abbey successfully passed the test as AKC Canine Good Citizen and became certified in February 2017. Shortly thereafter, Abbey and her owners joined the Armed Forces YMCA Pet Therapy Program at the Naval Medical Center in San Diego, visiting both inpatients and outpatients of all ages and illnesses. Per Naval records, Abbey and the ladies collectively registered 168 hours of Animal Assisted Therapy with an impressive estimated 7,500 staff, patient and visitor interactions for 2017. Currently Abbey visits and "works" at the Emerald Coast Children's Advocacy Center in Niceville three hours a week. She is also part of the Pet Therapy Program at FWB/Valparaiso Airport where she meets and greets travelers. In her spare time, she is the local "ambassador" for tourists and residents alike in and around their home in Destin. 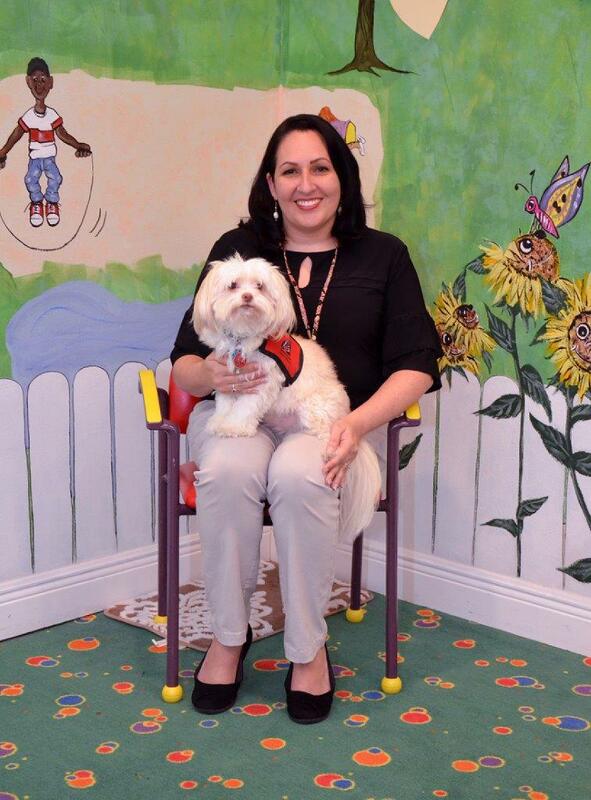 Abbey, the 4-year old Maltese therapy dog for ECCAC and VPS airport, with owner/handlers Roslyn Lindeman and Jennifer Town. DeFuniak Springs, FL (July 15, 2018)…Meet Miles, a recently trained Labradoodle therapy dog and his owner/handler, Shannon Garcia. 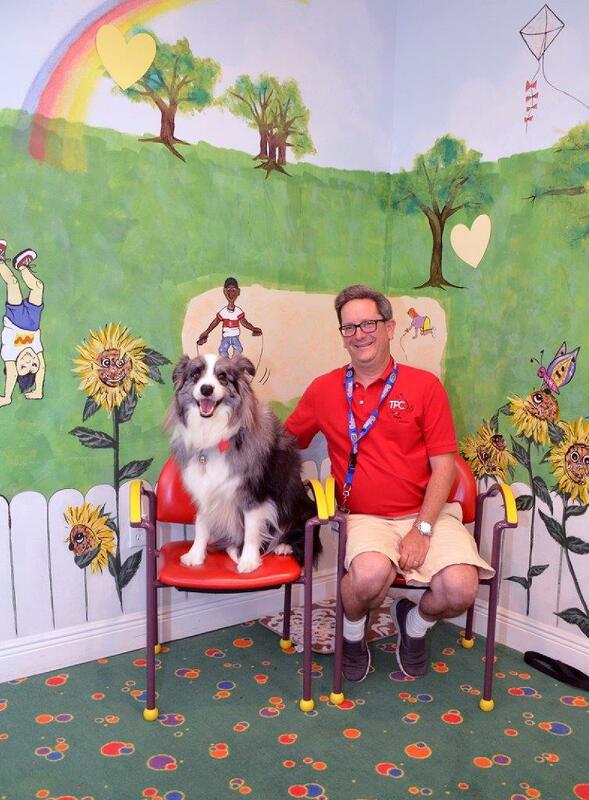 Miles helps make the day a little better and brighter twice a week for child victims receiving services at the Pierce Family Children’s Advocacy Center in DeFuniak Springs. Shannon is a licensed mental health therapist on staff with the Emerald Coast Children’s Advocacy Center (ECCAC). Miles is only one-year old and Shannon got involved in the various training processes/classes for both herself and Miles this past year. 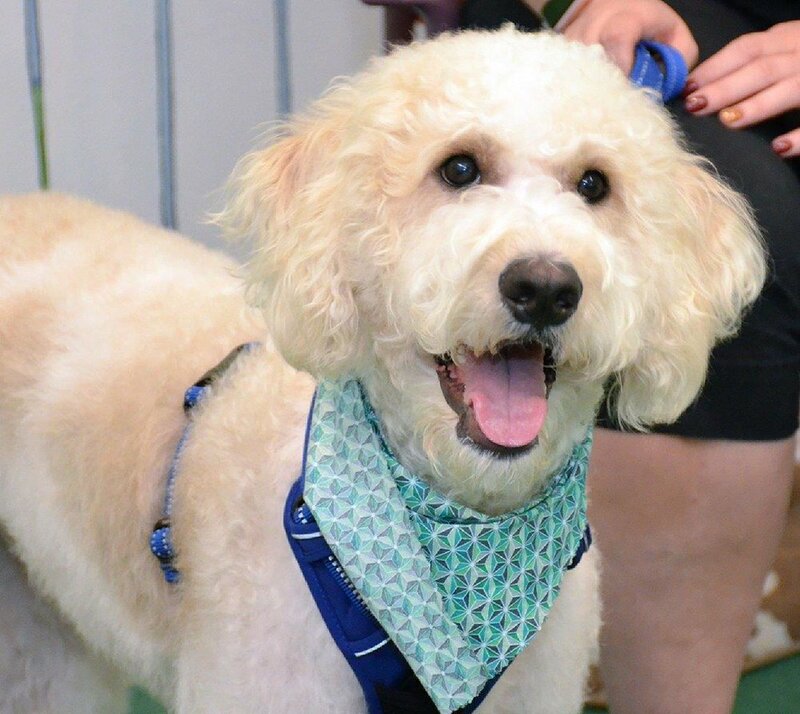 The Labradoodle completed the AKC Canine Good Citizenship training and is currently in training for TCP (Therapy Patient Connections) Good Citizenship certification. Shannon Garcia and her Labradoodle, Miles. 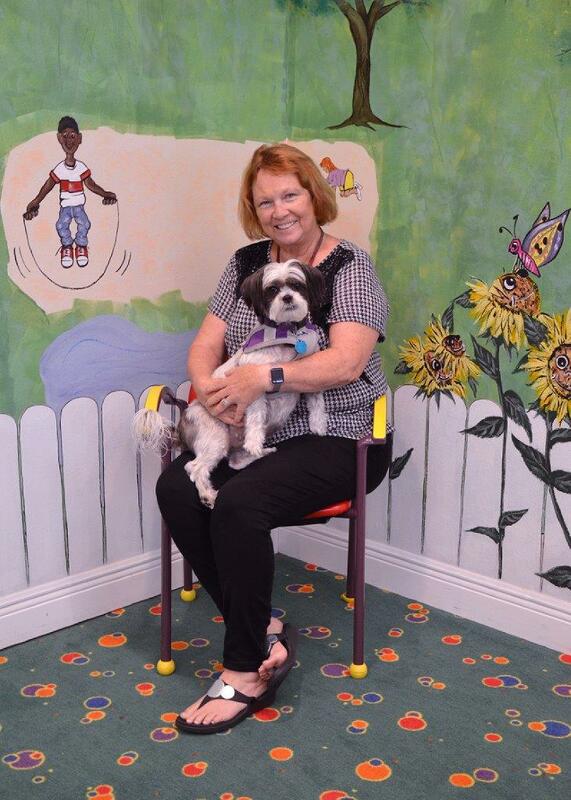 Niceville, FL (July 15, 2018)…Meet Tiny and Marlin, trained therapy dogs and their owner/handlers, John and Lisa Dunphy. They help make the day a little better and brighter for child victims receiving services at the Emerald Coast Children’s Advocacy Center (ECCAC). Tiny is a Great Pyrenees and Marlin is a Border Collie. The Dunphy’s got the rescue dogs from a kennel in Kansas City. They have since passed the testing and training to be certified as TPC (Therapy Patient Connections) Good Citizenship Dogs. The Dunphy’s and their dogs have also been through training Animal Assisted Interaction classes. “We volunteer with Tiny and Marlin to help out every other week at ECCAC’s Niceville Center,” commented the Dunphy’s. “As well, we make visits to the Gulf Coast Treatment Center for young girls in Ft. Walton Beach and the Twin Cities Pavilion assisted living facility in Niceville. John Murphy with his Border Collie, Marlin. Lisa Dunphy with her Great Pyrenees, Tiny. 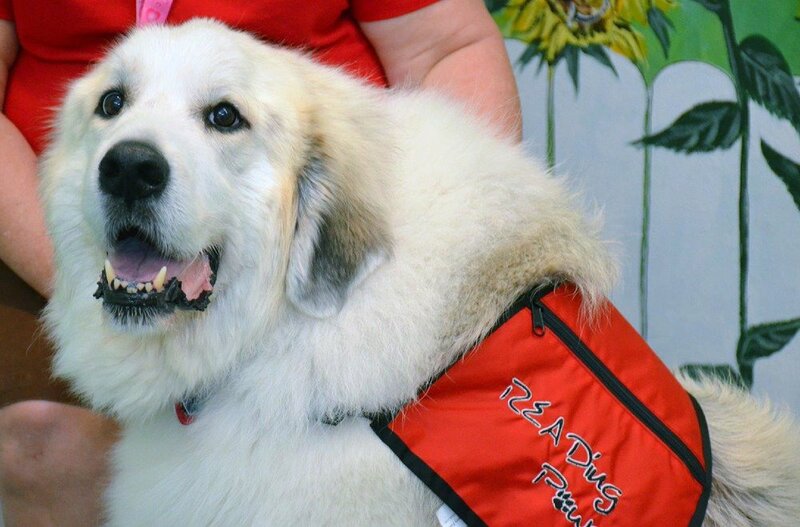 Niceville, FL (July 15, 2018)…Meet Elsa, a trained Great Pyrenees therapy dog and her owner/handler, Dan Holmes. Elsa helps make the day a little better and brighter for child victims receiving services at the Emerald Coast Children’s Advocacy Center (ECCAC) in Niceville. Dan got Elsa at Alaqua Animal Refuge. He then went through six weeks of beginner obedience training, six weeks of intermediate obedience training and three weeks of training to enable an AKC Canine Good Citizen certification for Elsa. In the last fifteen months, Elsa and Dan have made 130 therapy dog visits, including one court appearance last December to help an ECCAC child victim deal with the stress of a court appearance. Basically, for four days of every week, Dan and Elsa volunteer by going to the Niceville ECCAC; remedial classes at Freeport Elementary where a child reads to Elsa; The Manor at Blue Water Bay; a visit to the Destin/FWB Airport to greet passengers; and they have just started going to the Rehabilitation Institute of Northwest Florida. Indeed, they keep one busy schedule spreading happiness and help to many. Dan Holmes and his Great Pyrenees, Elsa. DeFuniak Springs, FL (July 15, 2018)…Meet Dozier, a trained Great Dane therapy dog and his owner/handler, Angie Nousiainen. Once a month, Dozier and Angie help make the day a little better and brighter for child victims receiving services at the Pierce Family Children’s Advocacy Center in DeFuniak Springs. Dozier completed four levels of obedience classes at Dog Max, Inc. At 14 months old, Dozier received his Canine Good Citizen Award before being accepted into Therapy Dogs, Inc. 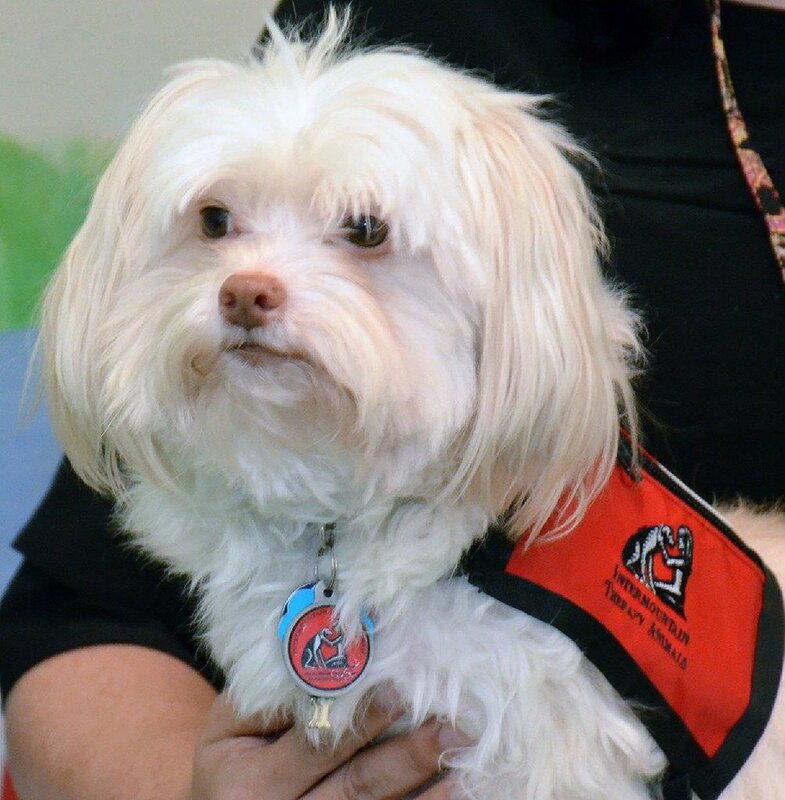 The Alliance of Therapy Dogs, based in Michigan, carries a $5 million liability insurance policy on Dozier. Angie Nousiainen and her Great Dane, Dozier. 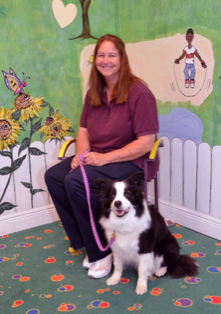 Meet Annie, a trained Border Collie therapy dog and her owner/handler, Kathy Kent. 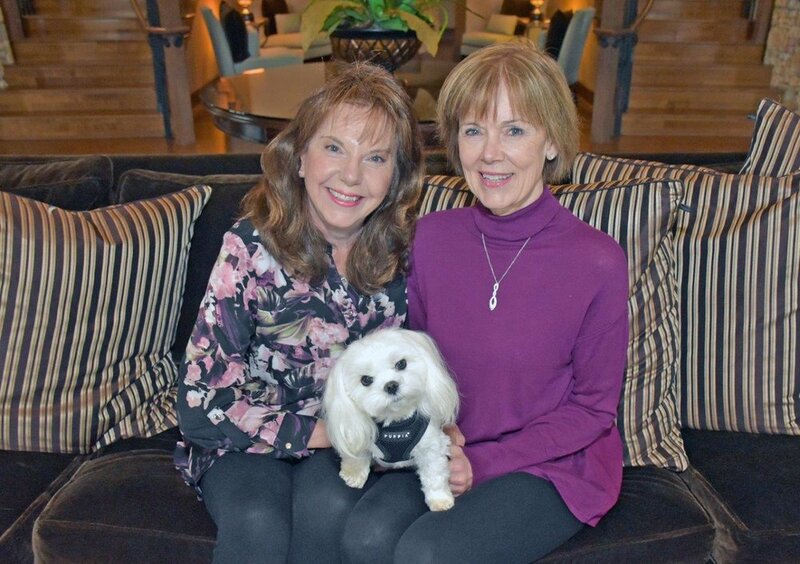 Once a week, Annie and Kathy help make the day a little better and brighter for child victims receiving services at the Pierce Family Children’s Advocacy Center in DeFuniak Springs. 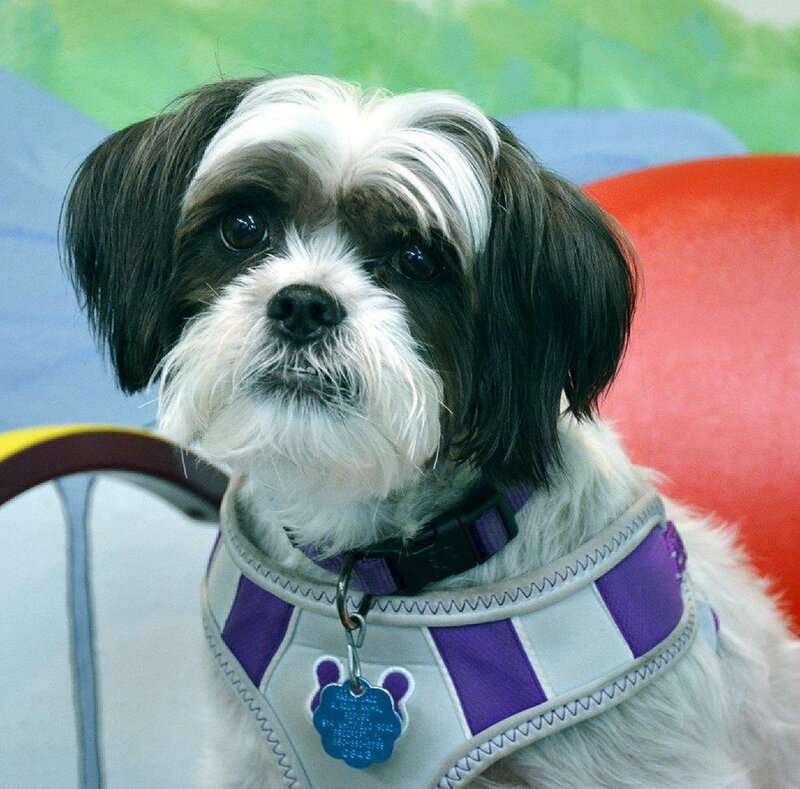 Trained from when she was a puppy, Annie is certified by TDI (Therapy Dogs International). The now 3 year-old Annie has been in numerous AKC Championship competitions earning many titles such as Herding, Lure Course and Barn Hunt. Kathy has a total of four dogs, of which two are therapy dogs, and she has been showing her dogs in competition for seventeen years.